A Congress for Lay Carmelites from (northern) Europe will be held at Aylesford Carmelite Priory in Kent between 25th and 28th July 2014. 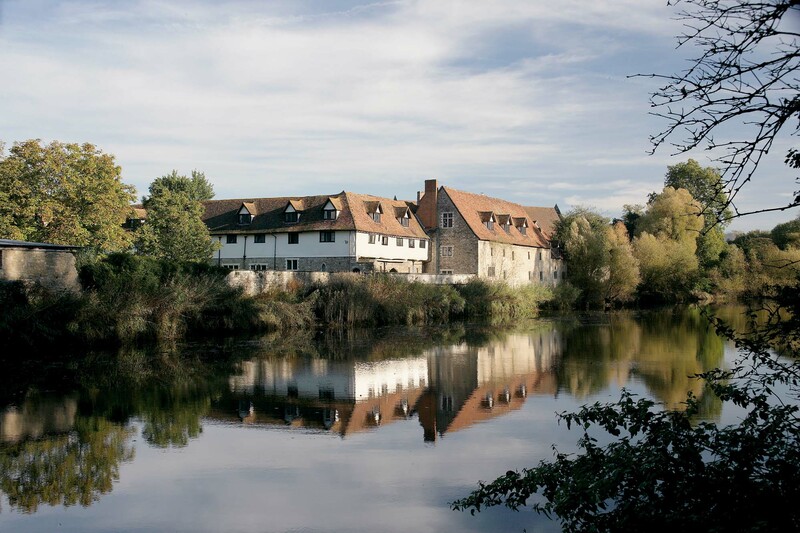 The Congress will take place at Aylesford Priory (also known as "The Friars"), which is one of the most historic and significant Carmelite sites in the world. Aylesford Priory, seen from the River Medway. Established by hermits from Mount Carmel in 1242, five years later Aylesford hosted the first General Chapter of the Order at which the hermits resolved to become mendicant friars. This fundamental decision about the future of the Order led to Aylesford sometimes being nicknamed 'The Second Carmel'. At the English Reformation in the 1530s the priory was dissolved, but - with international assistance from across the Order - the friars returned to their ancient home in 1949. Today it is a major site of pilgrimage and retreat ministry. The name 'Aylesford' derives from the Old English meaning 'A crossing place for all people', which seems particularly appropriate for the European Lay Carmelite Congress. The priory has hosted many international gatherings of the Order at various times, including some of the early International Lay Carmelite Congresses. 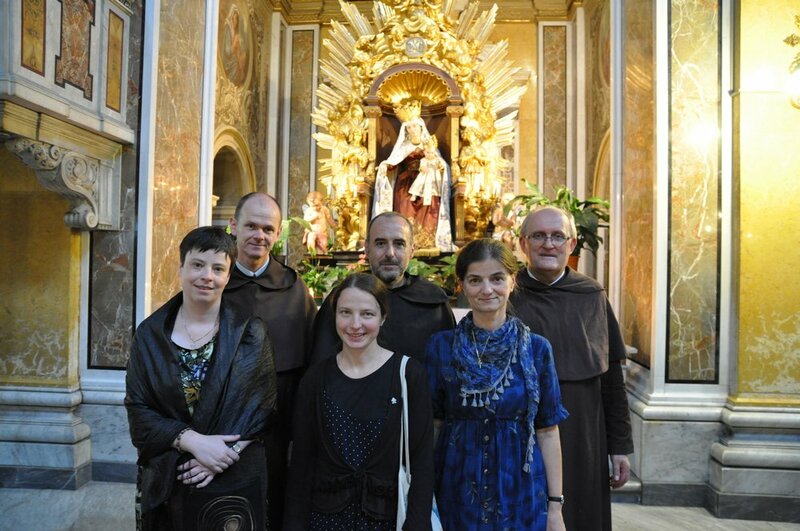 International Lay Carmelite Congress in Rome. Aylesford is in south eastern England, in the county of Kent, approximately 40 miles from London. The southeast of England is well served by public transport. Those flying to England are advised to arrive at one of London's airports; London Gatwick is probably the easiest. From here it is possible to hire a car to reach Aylesford, or catch a train to central London. Trains go from London Victoria station to West Malling and Maidstone East stations every half hour. From West Malling and Maidstone East it is possible to catch a taxi to the priory (about £15). Those travelling from the Continent by train can catch the Eurostar from Paris, Brussels, Lille, etc. The nearest stop to Aylesford is Ebbsfleet International, or you can continue to London St. Pancras International. If delegates can offer a lift from near Aylesford, or would like transport in the Aylesford area, we will try to organise this. Those wishing to arrive at Aylesford before the Congress, or remain some days after, are able to book additional nights at "The Friars". Trips to sites of interest in the area - such as London and Canterbury - can easily be made from Aylesford. If there is sufficient interest, an additional excursion to the Carmelite shrine of St. Jude at Faversham and to Canterbury or Rochester Cathedrals may be organised at the end of the Congress. Participants at the International Lay Carmelite Congress from Central Europe. The precise programme is yet to be put together, but the Congress will begin at 16.00 on Friday 25th July, and close at 14.00 on Monday 28th July 2014. During the Congress there will be times of worship and prayer, presentations from different countries, and social time. Essentially, all are welcome. We particularly encourage Lay Carmelites (members of the Third Order, Secular Institutes, Carmelite Spirituality Groups, etc.). Other members of the Carmelite Family who work closely with the laity - such as friars and sisters - are also most welcome. The focus of the Congress is Lay Carmel in Europe, which is a particular region of the Order. There are Lay Carmelites across the continent of Europe, and all are welcome at the Congress. However, our limited resources mean that - unlike the large scale International Congresses - we will not have translation facilities available. This means that the predominant language at the Congress will be English. Delegates who do not speak English are very welcome if someone else from their Province or area is able to translate for them. We anticipate that most interest will come from the 'northern European' region of the Order: Britain, Ireland, Belgium, The Netherlands, Germany, the Czech Republic, Poland, Lithuania and elsewhere. Hopefully, being so near France, we will have some delegates from there, and given their fluency in English delegates from Malta may also be interested in joining us. Delegates from other parts of Europe - such as Italy and Spain - are more than welcome to take part too. The cost for the weekend, full board, is likely to be about £175 (€215) per person at today's prices (this will probably rise a little by 2014). Carmelite laity from the Dutch and German Provinces with the Prior General. 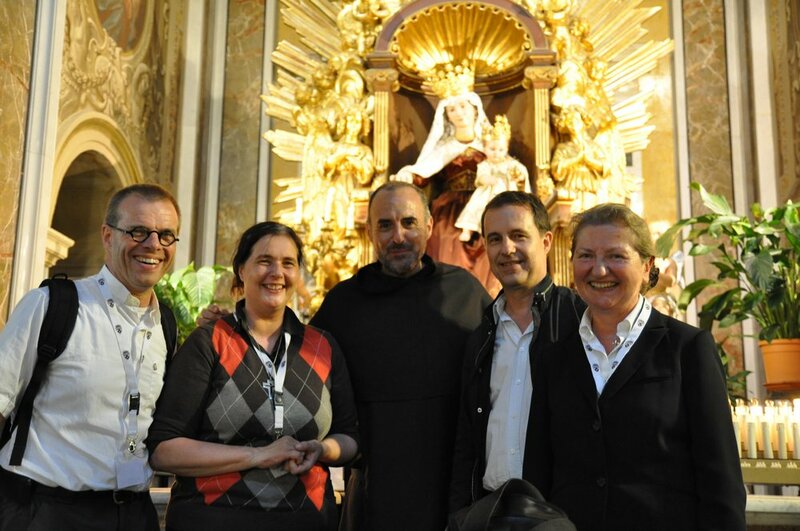 Why a Congress of Lay Carmelites in Europe? This initiative has been inspired by the International Lay Carmelite Congresses that take place every six years which gather delegates from across the world. 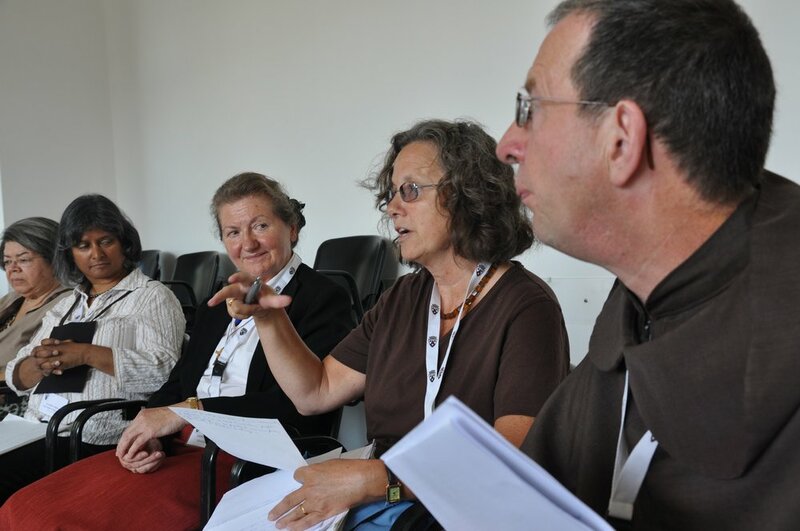 At the latest International Congress, which took place in Rome in September 2012, the cultural exchange was so fruitful that Lay Carmelites from northern Europe discussed the possibility of meeting together as a region every year or two in between the worldwide international gatherings. 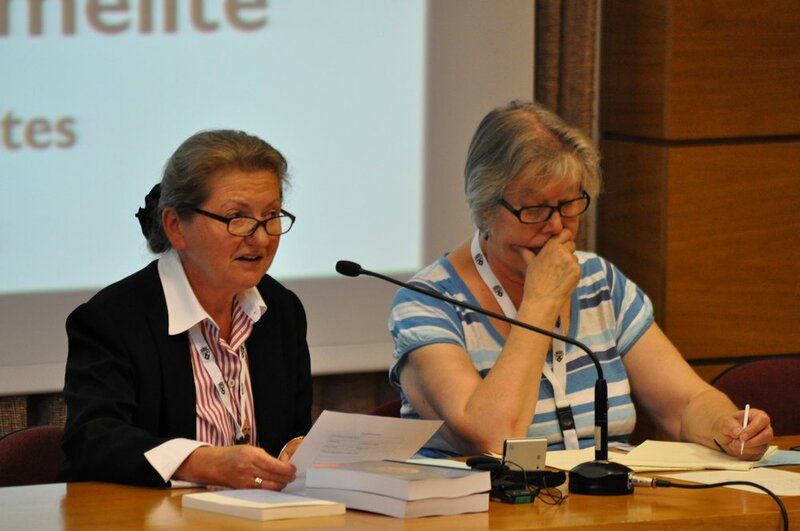 the International Lay Carmelite Congress in Rome in September 2012. Writing to Lay Carmelite contacts in northern Europe, the Prior Provincial's Delegate for Lay Carmel in the British Province, Mr. John Berry, said: "The purpose of these meetings would be simply to grow together as Carmelite Family, building up friendship and resources at the service of the Order." Just as the Provincials from northern Europe meet every year, so it is hoped Lay Carmelites will meet regularly to exchange ideas and support one another in living out their vocation. The Order faces many of the same challenges and opportunities across Europe, and so, John says, meeting together for friendship and ongoing formation seems like a sensible and timely idea. 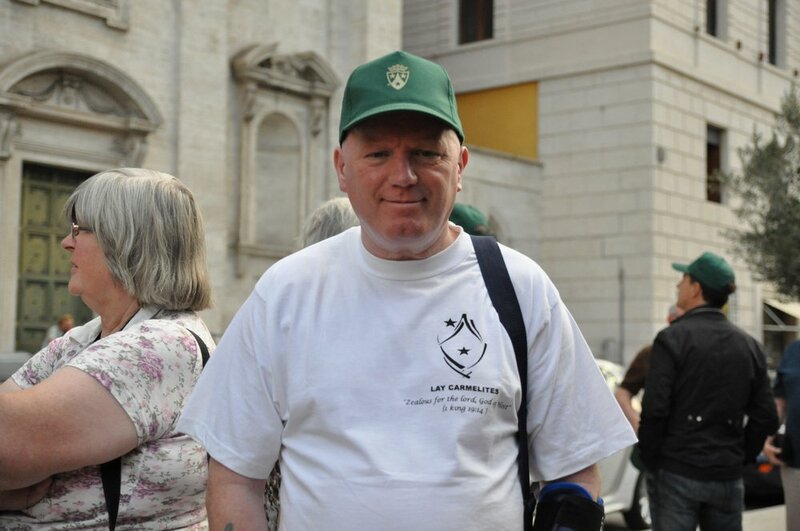 John Berry at the 2012 International Lay Carmelite Congress in Rome. The British Province will host this first event, with a hope that other provinces will undertake to make arrangements for future gatherings. John Berry said: "Aylesford can house up to 80 people. We hope to have a good turn out, but even if only a handful of delegates take part it will still help us to grow together as a family. I am confident that this will be a wonderful time of sharing the Order's charism."